Floor plan analysis is an important element of Feng Shui interior design consulting. A template or diagram called a "Bagua" is overlaid on the floor plan to help determine energy relationships in the living or working space. Photo courtesy of: Feng Shui for Us. Feng Shui is an ancient Chinese art form, developed out of the 2,500-year-old philosophy and religion of Taoism, that is focused on improving many aspects of one’s life - in particular, health, happiness, prosperity, social status, and personal relationships - through the enhancement and optimization of one’s living and working environments. It is comparable to acupuncture, and other forms of Traditional Chinese Medicine, in that it holds that all “buildings”, as opposed to “persons”, have a universal positive energy - “Chi” - flowing through them, and that obstacles to this Chi energy translate to difficulties in the financial, creative, and personal realms of one’s life and career. On a more practical or tangible level, the Feng Shui approach maximizes a building’s Chi energy by: A) creating harmony between architectural and interior design; B) utilizing the five basic phases of nature: water, wood, fire, earth, and metal; and C) arranging and positioning furniture, decor, and small objects to let Chi energy flow better. Under the theory of Feng Shui, each of the five phases of nature have their own Chi energy and benefits. Concrete, as a building material, falls under the “Earth” phase, and is the most important, or fundamental Earth phase element. Its use in a home or place of business brings positive Chi energy in several ways: 1) grounding and stability; 2) peace, safety, and security; 3) family happiness and joy; 4) self-confidence, kindness, and personal generosity in relationships; and 5) good health. The use and Feng Shui benefits of concrete in a structure (e.g., walls, floors, beams, pillars, tabletops, countertops), may then be enhanced through the use of earth tone colors - pale yellows, oranges, browns, greens - and earthen shapes - rectangles, squares, arcs, and horizontal & vertical lines. As such, according to Feng Shui thinking, acid-stained concrete flooring introduces Chi energy into living and working spaces in a major way. Not only is the floor based on the earth phase element of "concrete", but the coloring from acid staining is based on the earth tone colors, and the subsequent use of joints and saw-cuts in an acid-stained concrete floor design incorporates “earthen shapes", as well (for more on the use of joints and saw-cuts in floor design, see Decorative Concrete Scoring). Simultaneously, the smoothness of concrete flooring, its cleanability and easy maintenance, and the confluent, marbling effect of acid stain work to dissipate and prevent what is referred to as “stagnant Chi energy" from accumulating in a structure, and blocking positive Chi energy. 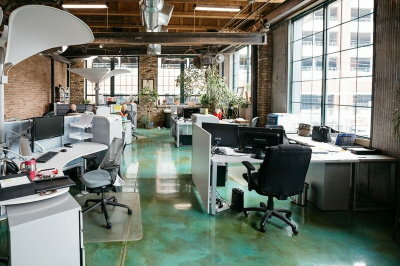 This green & copper acid-stained concrete floor is the basis for strong Feng Shui (or Chi energy) in this corporate office space. The walls are also either concrete or brick, and these Earth elements are balanced by Wood elements used for the ceiling (wood rafters) and decor (plants throughout). Feng Shui has grown greatly in popularity in the Western hemisphere over the last 40 years, and its principles have become mainstream in many U.S. architectural and interior design circles, as well as the world of corporate consulting. For many people, Feng Shui has become as trusted and reliable in increasing their overall feeling of health and well-being as Chinese medicine, and other novel approaches to health, like aroma or nutritional therapy, and massage. Other people no doubt prefer to refer to the overall beauty and comfort of a building exterior, or interior room, as simply "great ambience", rather than Chi energy. Regardless, acid-stained concrete flooring is a quick and sure way to create a terrific foundation and strong sense of security in a room that cannot help but be impressed upon the senses of its occupants, guests, visitors, or customers. We have seen and heard this firsthand, time and again, over the past twenty years from our customers upon finishing a floor for them, or receiving feedback from them shortly thereafter.